A Malaysian man's method of disciplining his child after the boy was caught on camera bullying his younger brother has sparked debate on social media. 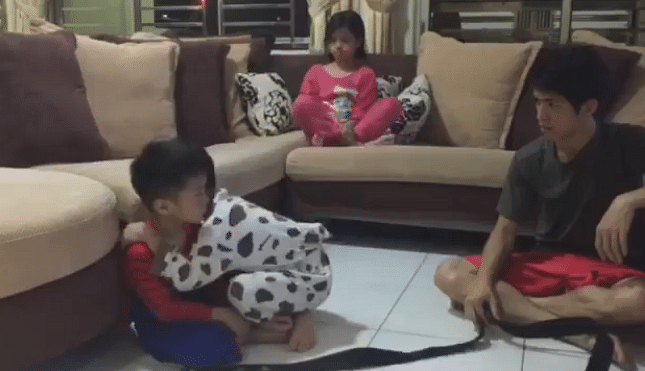 In a Facebook post on Monday (June 25), Mr Paul Lee, who lives in Johor Baru, shared a video of him restraining his middle child after he was caught kicking his younger brother in the head multiple times. 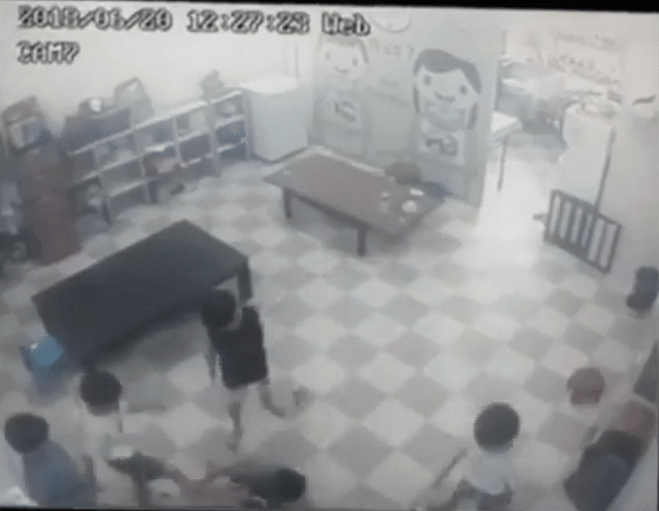 The incident occurred at an unidentified tuition centre on June 20, according to the date stamp in surveillance camera footage. The video, which has been watched more than 850,000 times and garnered more than 21,000 shares, shows Mr Lee tying the elder son up with a black belt, saying: "Now you know how it feels like to be bullied. Does it feel good?" He also questioned the boy, saying: "Why did you bully my family?" He then asked the boy to lie facing down on the ground while being restrained. Mr Lee then turned to his youngest son, and asked him why he had allowed his brother to bully him. "Why didn't you run away? He kicked you so hard, shouldn't you have run away?" Mr Lee said. He added that if he could not run away from the bully, he should immediately inform the teacher instead of letting himself be bullied. "Don't let anyone bully you, understand?" he said. He gave the boy two options: to kick his brother back in the head, or to free him from the restraints. "Whatever you choose to do, I will not scold or beat you," he told the boy, who started crying. The boy was then seen being comforted by his elder sister, and they both released their brother from the restraints. The two boys, both in tears, then made up with a hug. In his post, Mr Lee said he had decided to take this approach to disciplining his child after seeing the footage of him kicking his younger brother. "I don't know if such a method is right or whether it will be effective, but for a child who has been scolded and punished many times before, I decided I had to try something different," he wrote. He added that while the incident took place at a tuition centre, it is not the fault of the teachers and, instead, it is the parents' responsibility to discipline the ones involved. "Parents must not think that just because they paid money to tuition teachers, that they are responsible for both their children's academic and character development," he added. "If anyone has any tips or knows a better way to discipline children, please share." In the comments, people were divided over Mr Lee's methods. One Facebook user criticised the video, saying that Mr Lee should not have tied his son up and posted it online. "Violence does not come only in physical forms. Emotional violence and trauma are even worse," said Facebook user Lawrence Lee. "They are both your children... By saying 'my family', you are creating a divide among your children," he added. Another netizen Alice Oh said: "I initially thought your second son was not your biological son! And how could you teach your youngest child to fight back?" However, others were touched by the youngest child, who decided not to take revenge on his elder brother. "Teaching kids right from wrong, the significance of duty and how to treat their own siblings, by confronting them with moral dilemmas - it's a very important lesson to teach and to learn from. Harsh and strict parenting but necessary," said Facebook user Sherilyn Ng.